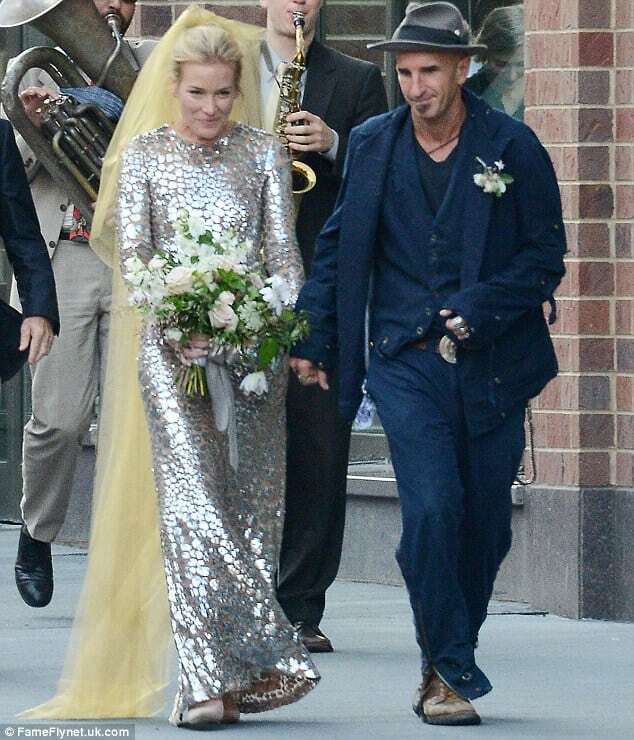 Piper Perabo rocked an unusual silver wedding dress on July 26, 2014, as she married producer Stephen Kay in New York City. Stephen works as an executive producer and director on the set of Piper’s TV show, Covert Affairs. The Golden Globe-nominated actress wore a shimmering Michael Kors bridal gown in style with the New Orleans themed wedding. Her groom, Stephen, continued the theme with a loose fitting blue three-piece suit. The ceremony included close friends and family members at the city’s Merchant’s House Museum. As they made their way outside onto the street a New Orleans band joined them. Fun Fact: This is the first marriage for Perabo who was 37 at the time of her wedding and was last linked to Sam Rockwell. It was also the first marriage for 50-year-old Kay who had dated Eva Longoria.